McAfee Security Scanner for Databases automatically finds databases on your network, determines if the latest patches have been applied, and tests for weak passwords, default accounts, and other common threats — making it easier to demonstrate compliance to auditors and improve protection of critical data assets. If you are interested in an enterprise-class, centrally-managed database vulnerability management solution (with additional capabilities such as scheduled scans, scan history, McAfee ePolicy Orchestrator (McAfee ePO) integration, etc. ), please see McAfee Vulnerability Manager for Databases. Tactical database security scanner — McAfee’s database security scanner (DSS) is aimed primarily at internal or external auditors looking to perform ad-hoc database vulnerability scans. Maximum visibility into security posture — Security Scanner for Databases gives auditors, pen testers, consultants, and database administrators a solution for gaining unmatched visibility into an organization’s security posture by conducting a thorough check of more than 3,500 potential database vulnerabilities. Actionable data to address risk — With Security Scanner for Databases, you can review expert recommendations to address these risks, helping to build an effective database security policy and meet regulatory mandates. You store your most valuable and sensitive data in a database, but most vulnerability management systems don’t know enough about these complex systems to thoroughly test them, putting this data at risk. Every week there is yet another announcement of a major data breach, and research shows that the largest breaches, representing 75 percent of records, according to Verizon’s 2009 study, come from databases. McAfee® Security Scanner for Databases delivers a vulnerability assessment solution, with tools for penetration testing and detecting changed objects, including rootkits, while providing detailed information on each threat, including fix scripts and suggested changes to remediate discovered issues. By using all the powerful features contained in McAfee Security Scanner for Databases, consultants, auditors, pen testers, and database administrators have the tools they need to help organizations prepare for and perform well on audits, while reducing the possibility of suffering a damaging breach. Detect altered data, including modifications of privileges and user tables, while spotting security issues such as SQL injection vulnerabilities. Use out-of-the-box compliance reports to uncover potential issues before an audit, minimizing the time and cost involved in confirming remediation post-audit. Organize items by priority and review actionable recommendations for remediation. The database browser interface allows for quick application of fixes across multiple databases. Detect weak passwords, shared passwords, and hashes passwords while downloading data for local analysis to avoid affecting database performance. By conducting more than 3,500 different checks of Oracle, Microsoft SQL Server, IBM’s DB2, and MySQL databases, McAfee Security Scanner for Databases provides an optimal, comprehensive assessment, evaluating risk from virtually all known threat vectors. This information can then be used to demonstrate compliance for audit purposes and to improve overall security for an organization’s most valuable data. Many organizations don’t have an accurate view of where all their databases are and which ones contain restricted content. 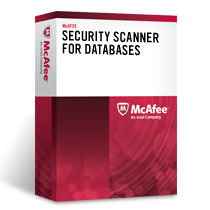 McAfee Security Scanner for Databases searches the network for databases and scans tables for passwords, credit card details, Social Security numbers, and other PII. These discovery features speed deployment and improve coverage, quickly building a complete map of an enterprise’s data at risk. Sometimes less is more, as many vulnerability assessment tools often overwhelm the user with a myriad of minor threats, hiding the critical issues that need to be addressed. McAfee Security Scanner for Databases, developed in conjunction with experts in database security audit, clearly classifies threats into distinct priority levels and goes one step further to provide fix scripts and recommendations whenever possible. The result is a system that focuses effort on the most severe risks and saves time and money by leveraging the knowledge of leading consultants and researchers in terms of how to best fix gaps. The centralized database browser of McAfee Security Scanner for Databases is an indispensable tool for database administrators during the performance of their daily tasks. With the ability to quickly view details for databases anywhere on the network, database administrators can check the configuration of hundreds of databases in parallel, reducing many hours of work to just minutes. Download the McAfee Security Scanner for Databases Datasheet (PDF).